L to R: Steven Peralta, Chair of the Provost’s Committee for Staff and Director of Academic Advisement at the UNM School of Engineering; Professor John LaVelle, UNM School of Law; award winner Mitzi Vigil, Administrator of the Law and Indigenous Peoples Program at UNM School of Law; Melissa Vargas, Strategic Planner and Director of Staff for the UNM Provost's Office; and Professor Christine Zuni Cruz, Associate Dean for Indian Law and Director of the Law and Indigenous Peoples Program at UNM School of Law. 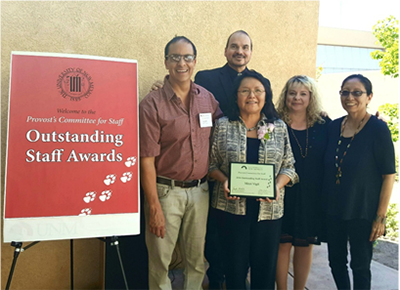 Mitzi Vigil, Administrator of the Law and Indigenous Peoples Program, is a recipient of the prestigious 2016 UNM Outstanding Staff Award from the Provost’s Committee for Staff. Awardees were honored at a ceremony on Friday, May 20, at the University Club. “The University, the Law School, and the Law and Indigenous Peoples Program are grateful to Mitzi Vigil for her career of exceptional service at the highest levels of administrative ability, professionalism, and integrity,” said Professor John LaVelle, former director of the Law School’s Indian Law Program. Vigil also received the Law School’s “Outstanding Staff Award” for 2016, given by the Recognition and Rewards Committee.